Today I am reviewing Bright Starts™ Having A Ball™ Giggables™ and Taggies™ Little Taggies™ both of these items are awesome Jayce can use both of them and loves them both as for Jordyn she gets more use out of the Having a Ball Giggables. Jayce cuddles up to the Taggies Blanket it is so soft and now that he is teething he gets extra comfort chewing on the little tags. These items are so small but yet so entertaining to children and these range from age 6-36 months but my daughter is almost 4 and still likes to play with the have a ball Giggables. Delight toddler with these cute animal themed balls that make silly sounds as they wobble and roll across the floor! With 6 different characters to choose from your toddler is sure to laugh out loud! Features: Animal themed character balls that wobble and roll when pushed. Push balls along to hear silly sounds. 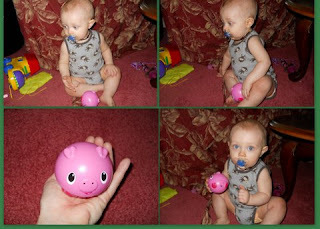 The Giggable we reviewed is the pig besides Jayce loving this Jordyn is almost 4 and she loves it too. They have been playing together with this. This is such a cute item and I foresee Jayce and Jordyn playing with this for a long time to come!! Another item we were able to try for review is the Bright Stars Little Taggies we were sent the Taggie blanket that is blue with the clouds all over it now Jayce loves the feel of this blanket it is so soft and now that he is teething he chews a little on the tags on the blanket which is fine with me but he finds this very comforting we love the taggies blanket and right now I am having issues uploading these pictures so enjoy the pic's we found!! A little about taggies..
And you want to know.. What are Taggies?? Inspired by her children’s affection and attachment to smooth, satiny looped tags, a real mom nurtured Taggies from an idea to a "must have" item for little ones around the world! For well over a decade now babies and children have been comforted by their soft, colorful and comforting Taggies. Every Taggies product offers children a varied assortment of printed and textured tags to explore and enjoy! What moms & dads have to say about Taggies! All in all I love these products and will continue to use these for my kids and I know they will continue to use them too! !